When I read that first sentence from “Have a Nice Conflict” I said to myself, “God, I am going to hate this book.” I’m an engineer by trade. I have a black and white personality. Let me come clean on the truth: My book reading (and writing for that matter) for the last decade has been limited to mostly software and fly fishing. Don’t get me wrong. It’s my job to read. A huge portion of my day is spent reading. But, the sheer thought of reading a management self help book made me cringe. I have tried to read books like this, but I never finish. 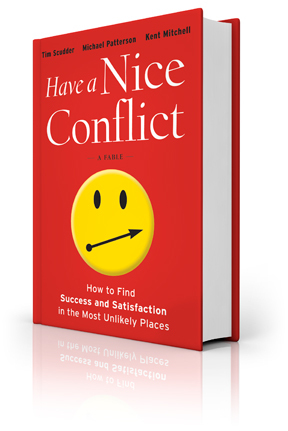 This book “Have a nice Conflict” is climbing the Amazon and NY Times Best seller list. And now that I have read the book, I can see why. From where I write this in my office I can clearly see the books, “Execution”, “Never Eat Alone”, “The Five Dysfunctions of a Team”, and “How Full is your Bucket” among other self help business books in my bookcase. And I look back at all those like it was a waste of my time to read them. It’s not that they are not valuable, I know they are very valuable for many people. They just didn’t feel like reading them was a good spend of my time – Again the weakness / arrogance of my black and white personality. Well, that, and to be frank, turning turning obvious concepts into books seems like such a waste of trees. But, the engineer is an interesting breed. As any PM will tell you they are very hard to manage. Why? Well I disdain generalizing any group of humans, but where in the world do we find a group of such arrogant “I’m the smartest person I have ever met and not only do I know everything about engineering I know everything about everything.” and at the same time have such fragile egos that need to be constantly appreciated than engineers? This group is rife with conflict. And I’m one of them I fear. And it’s not like I wasn’t aware of it until reading the book. I was. But, the biggest lesson I learned from reading the book is that as a “Red”, I leave a huge calamity of conflict in my wake…and I don’t even realize it. The book has helped to explain why I am so puzzled at some people’s reactions to the “matter of fact” things I say. You’ll have to read the book to figure out what a “Red” is and all the other colors of humans that the book classifies. If you are an engineer or have to work with them directly, I strongly recommend you get your hands on this book. It’s premise is preventing, managing and leveraging conflict. But, it is the details around the story told that pulls it together for “black and whites” like me. I am interested in looking over the color groups. Can I borrow the book if / when you have finished?